Aptly called the firebush, this attractive shrub is native to southern Florida, the West Indies, Central America, Bolivia, Paraguay, and Brazil. Brilliant orange-red flowers that bloom from spring through autumn draw butterflies and hummingbirds, making this a popular addition to gardens and landscapes alike. Firebush has been also used for a number of medicinal purposes. The leaves and stems have been used to treat skin rashes, fungal infections, insect bites, as well as for tanning. In Mexico, the fruit is used to make a fermented beverage. This shrub is known by the botanical name of Hamelia patens. The genus Hamelia was named in honor of French botanist, Henri Louis Duhamel du Monceau. Best known by the common name of firebush, this species is also called the butterfly bush, firecracker shrub, hummingbird bush, Mexican firebush, redhead, and scarlet bush. Recommended for USDA zones 8 through 11, the firebush is not cold hardy. Leaves will turn red when temperatures dip into the 40 F range. Once the temperatures reach the 30s the leaves will die and drop. Even if the foliage dies back all the way to the ground, new shoots will emerge in the spring as long as the roots do not freeze. Should the ground freeze, the roots will also die, causing the plant to perish. In warmer climates, firebush can grow as tall as 18 feet with proper support. The typical specimen is kept as a four to five foot mounded bush that requires no support. In tropical climates where the foliage is not damaged by cool temperatures, it is possible to train firebush to grow as a small tree. Firebush requires plenty of heat and full sun for optimal growth. Although it will grow in partial shade, it will not bloom as well as it does when given full sun exposure. If planted in climates that are subjected to freezing winter temperatures, it should be kept in a container and brought indoors. Although drought and heat tolerant, the foliage can be damaged by high winds, so take that into account when choosing a location. The firebush is soft-stemmed, having multiple trunks with smooth gray bark. Leaves are typically light to dark green and are arranged in whorls of three to five leaves. Growing up to six inches long, the leaves are oval in shape and covered with fine hairs. When temperatures are cool, the leaves will turn red to purple. 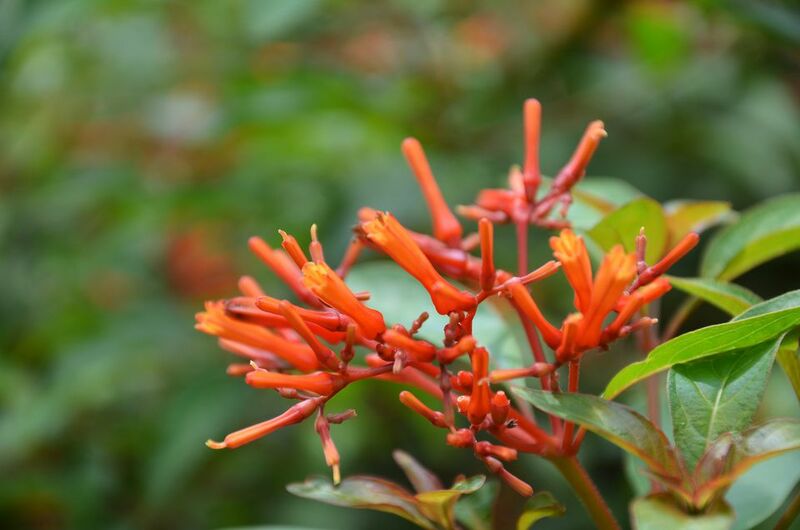 Clusters of red-orange tubular flowers are produced throughout the year in tropical climates, and from spring through fall in zones with subtropical winter temperatures. Following the flowers, small dark red berries are produced. The cycles of blossoms and fruits are non-synchronous, and it is not unusual for firebush to have both flowers and fruits appear at the same time. Firebush can be grown as either an annual in northern locations or as a perennial in southern climes. When grown as an annual recommended uses include borders and mass plantings, as well as containers for patios. It is particularly striking when coupled with white flowering annuals. Firebush is also popular in bird and butterfly gardens for its colorful blossoms and berries that attract a variety of wildlife. If grown as a perennial it can be used as an accent plant, in borders, as a hedge, or as a foundation planting for buildings. Hedge growth requires regular pruning to maintain the desired shape and size. It can also be grown as a small tree. Relatively easy to care for, the firebush does best in high heat conditions. It should be given a weekly watering but needs to have good drainage so that it does not stand in water. A spring application of a fertilizer designed to boost blossoming is beneficial. Little maintenance is required, but regular trimming during warm weather will keep it to the desired size and shape. Winter damage should be cut back in the spring. It can be grown as a small tree by choosing the strongest trunk (central leader) and removing all others as well as any shoots on the lower section of the trunk. Any new growth along the bare trunk should be removed regularly. This shrub is relatively pest and disease free. However, it can fall prey to mites and scales. In spring aphids are occasionally a problem, as well as caterpillars, lubber grasshoppers, and mealybugs.